I’d heard of Dragons before, but this Dragon seemed different; when compared to the “standard traits” of an Eastern Dragon. 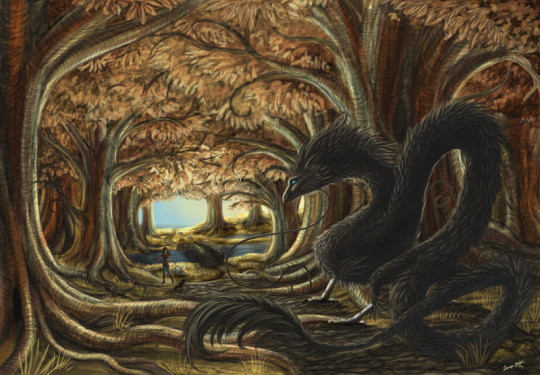 Whilst this Dragon was still “long and serpentine”; it’s talons, scales and snout – whispered more of bird! With a glance upon it’s feet, did it’s claws appear to be: more at home “upon a perch”, than upon this cobbled path. It’s twirling whiskers, and glowing eyes: tweet of Owl, and “Speak the Wise”. What was it the Dragon said? The gold of the Leaves and the bark of the Trunks. The gold of the Grass and the brown of the Boughs. The shelter of the Canopy and the arch of the Trees. For in this Woodland Lair – did this Dragon “dwell alone”. What was it the Dragon meant? A thousand years within this Kingdom: fall of Leaf and fell of Trunk. A timing of the perfect moment: shimmer Grass and glowing Bough. A hidden place within this Forest: with sheltered Canopy and armoured Tree. For in this Woodland hour – did this Dragon “guard alone”. What was it the dragon guarded? The entrance to these Woods – from daylight sun to autumn shade. The bridge across this River – from pastures light to autumn’s gold. The path along these Woods – from cobbled start to leafy sea. For in this Woodland Realm – I found this Autumn Dragon: Wise of Owl and Tide of Change. This entry was posted in Fantasy Dragon Art and tagged adventurer, autumn, dragon, dragon hoard, eastern dragon, fantasy, mythical creatures. Bookmark the permalink.